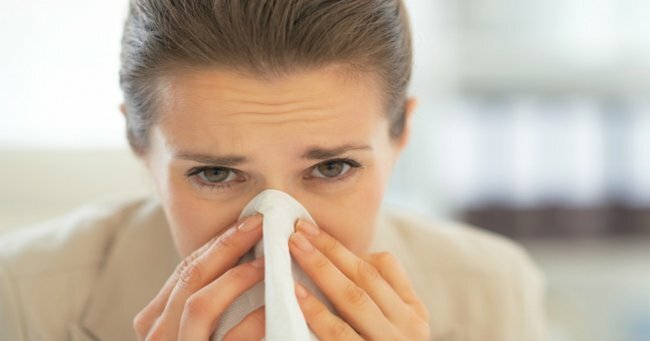 A new type of flu has been diagnosed - 'mum flu' and it has some unique characteristics. Imagine for a second that ‘man flu’ hit women as well. Imagine a legion of mothers contracted the debilitating virus and going down just like one does when one has a bad dose of man flu. Imagine for a second that a mother acted (okay, bad choice of word there) responded the very same way a dad did when she got the flu? Just think of the children. Imagine a mum with &apos;man flu&apos;. Via IStock. Now before I am hit with cries of sexism and generalisations, let me tell you that I have first hand experience with caring for someone suffering from man flu. 1. An insistence that “I’m fine, really". 2. Surreptitious visits to the chemist. Surely there is something that will get me through. 3. The realisation that even if you do sneak off for a sleep there’s not much point as the minute your head hits the pillow a child will be at your side wanting to know where the remote control/ iPad/ their ballet shoes/ the dog’s dinner is. 4. A relaxation of all the ‘rules’ at home. You want to watch Frozen again? Sure sweetie, lets turn it on. Oh, you want to watch it again. Go for it. 5. A blunt refusal to acknowledge that you feel like death warmed up. I AM FINE. I CAN DO IT. I&apos;ll be up in a second honey. Via IStock. According to the Cenovis Women’s Health Index, ‘mum-flu’, in stark contrast to its male equivalent, is characterised by a mother’s "duty to care for her family" even when she is unwell. The study by Cenovis found that one third (34%) of Australian mums pretend to be fine and power on when ill, compared to only 1 in 20 (5%) who take the necessary time to rest and recuperate. They found that in the last 12 months almost half (48%) of all working mothers have gone to work sick on two or more occasions because they’d exhausted their leave entitlements caring for their kids. For stay at home mums, 90% admit to caring for their family even when unwell themselves. 48% of all working mothers have gone to work sick on two or more occasions. Via IStock. Most mums I know do. But what these findings make me wonder more than anything else is why? We have an ongoing dialogue about the fact that dads are just as equipped to care for children as mums. We have an ongoing dialogue that responsibility for children needs to be equally divided between mums and dads. Of course in some families where only one partner works, in single parent households or where one works away from home a lot the responsibilities can’t be equally weighted. But it doesn’t mean we can’t ask for help? In more unsurprising results, the study found that two thirds (62%) of mothers admitted they felt overwhelmed and incapable when sick, yet prefer to remain the main carer for their children (51%) instead of calling on their mother or mother-in-law (7%) or paying a babysitter (3%). Practicing nutritionist and mother-of-two, Kate Freeman, said there is a lot of pressure for mums to ‘keep up appearances’. There is a lot of pressure for mums to ‘keep up appearances’. Via IStock. But who are we trying to keep up appearances for? Each other? Our children? It doesn’t make sense. “What we need to remember is that parenting is one of the toughest jobs in the world, but you don’t have to go it alone,” she said. The study found that the majority of both men and women in Australia (76%) agree that any mother raising a child has a tougher job than a CEO – and that Aussie mums work longer hours than the average CEO. Time to start acting like a CEO. Via IStock. Once in a while it’s okay to ask for help from neighbours, your mother-in-law, the teenager across the road. Wear the clothes on the floor kids mums not up washing them today. Value add when there is help available. Get your mother-in-law to cook a meal when she drops in to see the kids. No kids ever died by not going to soccer practice. Wind things down a little when you feel sick. Take away pizza again tonight?